Songs I Wish I Had Sung the First Time Around was Bing Crosby's fourth album for Decca and his fifth LP, recorded and originally released in 1956 on vinyl as Decca DL 8352. This was a concept album of sorts, as Bing covered some of his musical rivals' big hits, such as Al Jolson's "April Showers" and Nat King Cole's "Mona Lisa". 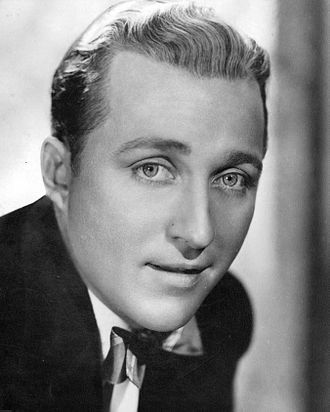 The jazz historian Will Friedwald wrote that the album "was essentially Crosby's way of acknowledging that he wasn't the only male singer to create hits and standards". 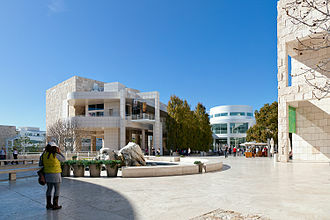 Crosby recorded the songs in April 1956 in Los Angeles, with orchestrations by arranger Jack Pleis. 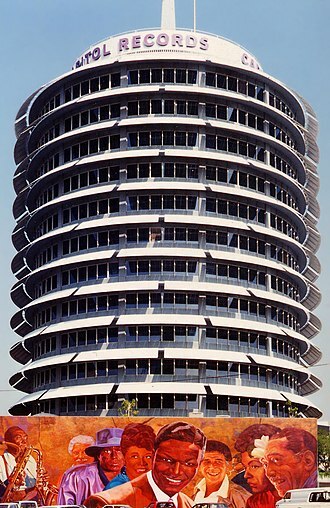 Longtime record producer Milt Gabler came up with the concept. All 12 tracks from Songs I Wish I Had Sung were released by Sepia Records on the 2011 CD Through the Years: Volume Nine (1955). Bing Crosby Enterprises and Universal Music issued a deluxe, 22-track version of Songs I Wish I Had Sung in 2014 which added many radio tracks to the original LP. Billboard reviewed the album, saying: "A fine, relaxed collection of a dozen old standards projected in the standard Crosby idiom. All of them are great songs which have been closely identified with – in fact, almost the personal property of great names in the business – 'April Showers,' 'Blue Heaven,' 'Thanks for the Memory,' 'Ain’t Misbehavin',' etc. Crosby gives them a personalized treatment for sure-fire deejay programming material." Buddy Cole (piano); Vince Terri (guitar); Don Whitaker (bass); Nick Fatool (drums); Skeets Herfurt, Harry Klee, Ted Nash (alto saxophones); Jules Jacob (tenor saxophone); Robert Lawson (baritone saxophone); Lou Raderman, Henry Hill, Ben Gill, Victor Arno, Toscha Seidel, Sam Cytron, Saul Steinberg, Nick Pisani, Jack Pepper (violins); Abe Hochstein, Milt Thomas, Raymond Menhennick (violas); Armand Koproff, Ossip Giskin (cellos). ^ Friedwald, Will (2010). A Biographical Guide to the Great Jazz and Pop Singers. Random House. p. 128. ^ "Sepia Records". Sepia Records. Retrieved July 20, 2015. ^ "Amazon". Amazon. Retrieved July 20, 2015. ^ "Reviews and Ratings of New Albums". The Billboard. 68 (35): 26. September 1, 1956. Retrieved January 17, 2017. Born in New York City, after he graduated from high school, he began writing songs and vaudevilles. 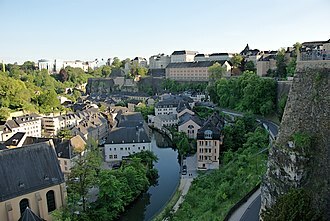 An important event was his meeting with the composer Harry Von Tilzer in 1898, the two began a songwriting partnership that lasted almost 30 years. He wrote the song Wait till the Sun Shines, Nellie in 1905, and he wrote On the Old Fall River Line with Von Tilzer and W. Jerome. He worked with Von Tilzer on the classic Pick Me Up, sterling died in Stamford, Connecticut on August 11,1955. With Arthur Lange, A Mothers Prayer for Her Boy Out There, New York, OCLC892504792 with Arthur Lange, Heres My Boy, New York, Joe Morris Music Co,1917. OCLC9892806 with Von Tilzer and W. Jerome, On the Old Fall River Line with Von Tilzer, Pick Me Up and Lay Me Down in Dear Old Dixieland Von Tilzer, New York, Harry Von Tilzer Music Pub. OCLC40708342 Wait till the Sun Shines, Nellie,1905 with Arthur Lange, New York, Joe Morris Music Co.1918. OCLC40913604 with Arthur Lange, Bernie Grossman, and Starmer, New York, Joe Morris Music Co,1918. Theodore Leopold Friedman, known as Ted Lewis, was an American entertainer, bandleader and musician. He fronted a band and touring show that presented a combination of jazz, comedy. He was known by the moniker Mr. Entertainment or Ted Is Everybody Happy, Lewis died of lung failure in August 1971. Born in Circleville, Lewis was one of the first Northern musicians to start imitating the New Orleans jazz musicians who came up to New York in the teens. He first recorded in 1917 with Earl Fullers Jazz Band, who were making an energetic if somewhat clumsy attempt to copy the sound of the citys newest sensation, at the time, Lewis did not seem to be able to do much on the clarinet other than trill. He improved a bit later, forming his style from the influences of the first New Orleans clarinetists to reside in New York, Larry Shields, Alcide Nunez, and Achille Baquet. 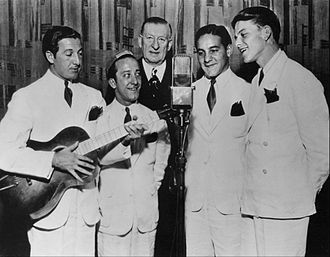 By 1919, Lewis was leading his own band, and had a contract with Columbia Records. For a time Columbia gave him a record label featuring his picture. At the start of the 1920s, he was considered by people without previous knowledge of jazz to be one of the leading lights of hot jazz. Lewis actually could play normally well, for years, his band included jazz greats Muggsy Spanier on trumpet and George Brunies on trombone. 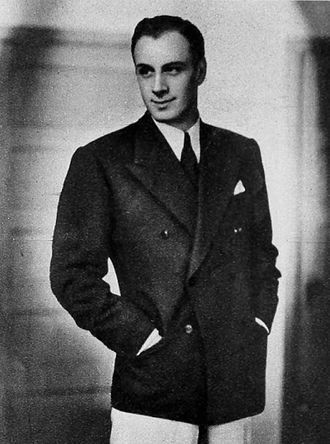 Lewis recorded for Columbia from 1919–1933 and he was on Decca 1934 into the 1940s. In 1932, Lewis recorded In a Shanty in Old Shanty Town and it was released on a 78 and reached number one on the charts where it stayed for 10 weeks. Through it all he retained his famous catchphrase Is everybody happy, Lewis adopted a battered top hat for sentimental, hard-luck tunes. Frequently he would stray from song lyrics, improvising chatter around them and this gave the effect of Lewis speaking the song spontaneously, When ma baby. When ma baby smiles at me, what a wonderful, wonderful light that comes to her eyes. 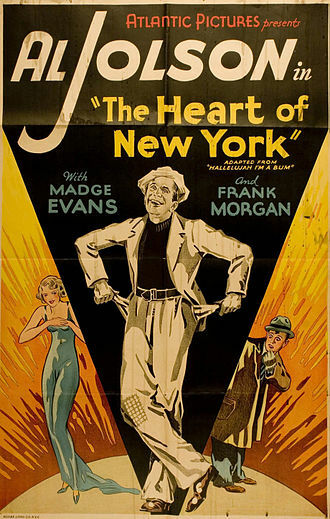 Lewis and his band appeared in a few early-talkie movie musicals in 1929, the first of several films titled with Lewis catchphrase, Is Everybody Happy. Thanks for the Memory is a popular song, with music composed by Ralph Rainger and lyrics by Leo Robin. It was introduced in the 1938 film The Big Broadcast of 1938 by Bob Hope and Shirley Ross, and recorded by Shep Fields and His Orchestra with vocals by Bob Goday. Dorothy Lamours solo recording of the song was popular, and has led to many mistakenly believing over the years that it was she, and Hope. In the film and Hopes characters are a couple who encounter each other aboard a ship. Near the films end they poignantly sing one of the versions of this song, recalling the ups. The song won the Academy Award for Best Original Song, and became Hopes signature tune, in 2004 it finished #63 on AFIs 100 Years.100 Songs survey of top tunes in American cinema. Martha Tilton sang vocals with Benny Goodmans orchestra recorded on December 2,1937, RCA Camden Records CAL-872 Mildred Bailey recorded the song on January 10,1938 with a mixed group featuring Chu Berry doing a nice tenor sax solo. Bing Crosby recorded the song for his 1956 album, Songs I Wish I Had Sung the First Time Around, ella Fitzgerald recorded this with André Previn and his orchestra in 1955 and on her 1967 Verve release Whisper Not, with backing by Marty Paich and his orchestra. 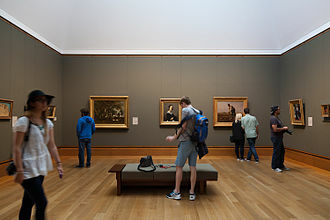 Mona Lisa is a popular song written by Ray Evans and Jay Livingston for the Paramount Pictures film Captain Carey, U. S. A. The title and lyrics refer to the renaissance portrait Mona Lisa painted by Leonardo da Vinci, the song won the Academy Award for Best Original Song in 1950. Musical arrangement was handled by Nelson Riddle and the backing was played by Les Baxter. The recording was originally the B-side of The Greatest Inventor Of Them All, the soundtrack version by Nat King Cole spent eight weeks at number one in the Billboard singles chart in 1950. Coles version of the song was inducted into the Grammy Hall of Fame in 1992, Cole described this song as one of his favorites among his recordings. The Billboard sales charts of 1950 showed significant sales on versions by Dennis Day, Hit versions for Moon Mullican #4 and Jimmy Wakely #10 were featured in 1950. Bruddah Iz covered the song on the album Alone in IZ World, bing Crosby recorded the song for his album Songs I Wish I Had Sung the First Time Around in 1956. Harry Connick, Jr. included the song on his 2009 album, a rockabilly version of Mona Lisa was released by Carl Mann on Phillips International Records in March 1959 and reached number 25 on the Billboard Hot 100. Conway Twitty recorded a version of Mona Lisa in February 1959, nevertheless, it peaked at number 5 in the UK Singles Chart in that year and in the top 30 in the United States. Sam Phillips signed Carl Mann to record his version of the song after the Twitty version began getting radio play in early 1959 and this was the most successful single in Manns career. The melody is different, and the lyrics are mostly the same as in the original version by Nat King Cole. 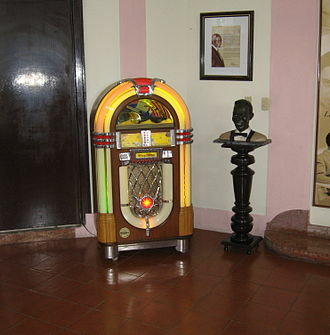 Brian Setzer covered the Mann version in his 2005 Rockabilly Riot Vol.1, A Tribute to Sun Records, the singer Don Cherry recorded a version backed by the Victor Young Orchestra which reached number seven in 1952. Andy Williams released a version on his 1964 album, The Academy Award-Winning Call Me Irresponsible, in 1994, Alexia Vassiliou covered the song in the live album from Sony BMG Horis Revma. Ruggiero Eugenio di Rodolfo Colombo, known as Russ Columbo, was an American baritone, songwriter and actor. He is famous for romantic ballads such as his signature tune You Call It Madness, But I Call It Love and his own compositions Prisoner of Love, Columbo was born in Camden, New Jersey, the twelfth child of Italian immigrant parents and Giulia Colombo. He attended Everett Grammar School and started playing the violin at a young age. He sang and played violin in numerous nightclubs, by 1928, at the age of 20, Columbo began to participate in motion pictures, including a Vitaphone short in which Columbo appeared as a member of Gus Arnheim and His Orchestra. Eventually, he did obtain some feature work in front of the camera, at the time of his death, Columbo had just completed work on the film Wake Up and Dream, he was on his way to stardom when his life was cut short. Among Columbos other films are, Woman to Woman, Wolf Song, The Texan, Columbo ran a nightclub for a while, The Club Pyramid, but gave it up when his manager told him he had star potential. In 1931, he traveled to New York City with his manager, songwriter Con Conrad, Conrad secured a late-night radio slot with NBC. This led to numerous engagements, a contract with RCA Victor records. Not long after arriving in New York, Columbo met actress Dorothy Dell at an audition for the Ziegfeld Follies, Conrad did his best to break the relationship up with a series of publicity-created ruse romances involving Columbo and actresses such as Greta Garbo and Pola Negri, it succeeded. The type of singing that was popularized by the likes of Columbo, Rudy Vallee, Columbo disliked the label, but it caught on with the general public. It gained popular credence, despite its use as a term of derision for the singers employing their low. Similarly, to reinforce his romantic appeal, he was called Radios Valentino, perry Como had a no.1 hit on Billboard with his recording. James Brown had a Top 20 pop hit and performed the song on The Ed Sullivan Show, on Sunday, September 2,1934, Columbo was shot under peculiar circumstances by his longtime friend, photographer Lansing Brown, while Columbo was visiting him at home. Milton Milt Gabler was an American record producer, responsible for many innovations in the recording industry of the 20th century. Milt Gabler was born in Harlem, New York, the son of Susie and his father was an Austrian Jewish immigrant, and his mothers family were Jewish immigrants from Russia. At 15, he working in his fathers business, the Commodore Radio Corporation. 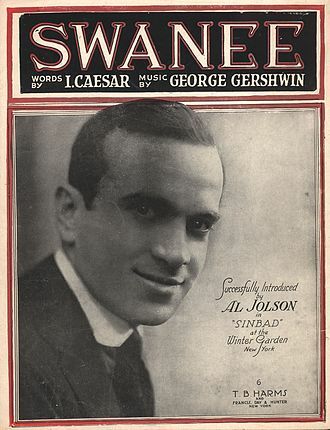 By the mid-1930s, Gabler renamed the business the Commodore Music Shop, Gabler started up a specialty label UHCA in about 1935 to reissue selected 78 r. p. m. Sides previously released by other companies and these reissues were from the original 78 stampers and were instrumental in spreading the concept of collecting classic performances from the past. A number of Paramount and Gennett sides were dubbed from clean copies and issued on UHCA, in 1937 he opened a new store on 52nd Street, and set up a series of jam sessions in a neighbouring club, Jimmy Ryans. Some of these he began recording, setting up his own record label and his role as a music producer soon superseded his other activities and he recorded many of the leading jazz artists of the day. 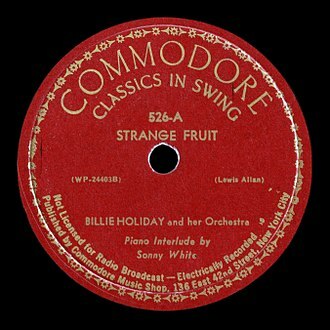 One regular customer, Billie Holiday, found her record company, resisting her appeals to release the song Strange Fruit, so she offered the song to Gabler. After getting the permission, he released her recording on Commodore in 1939, boosting her career and issuing what,60 years on. 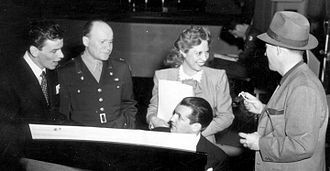 The success of Commodore Records inevitably led to an offer to join a major record label, Gabler was recruited to work for Decca Records in 1941, and left his brother-in-law Jack Crystal to run Commodore. In 1946 he produced and co-wrote Louis Jordan’s breakthrough single, Choo Choo ChBoogie, Gabler contributed a further slice of history when he signed Bill Haley and His Comets to Decca Records. He produced their initial recording session in April 1954, much of which was spent cutting a song which the thought the more likely hit of the two due to be recorded that day. 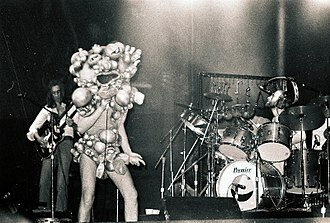 Their efforts on 13 Women left only ten minutes for the second song, Rock Around The Clock was cut in two takes and changed the face of popular music. 1941 RCA Victor 78 release by Tommy Dorsey and his Orchestra with vocal refrain by Frank Sinatra. The historic Mercer House in Savannah, Georgia.